Last year one of my resolutions for 2018 was to simplify my closet, hone in on my style and challenge myself to do a capsule wardrobe. I had previously been stuck in a rut, not really comfortable with my style after having kids and working to find something that fit in better with my day to day lifestyle. I worked through my closet and ended up started my capsule wardrobe challenge in mid-December with the intention to go through March. With life happening, here I am at the beginning of June and just now switching out my capsule wardrobe for the summer! So 5 months of wearing 40 pieces of clothing, whew! 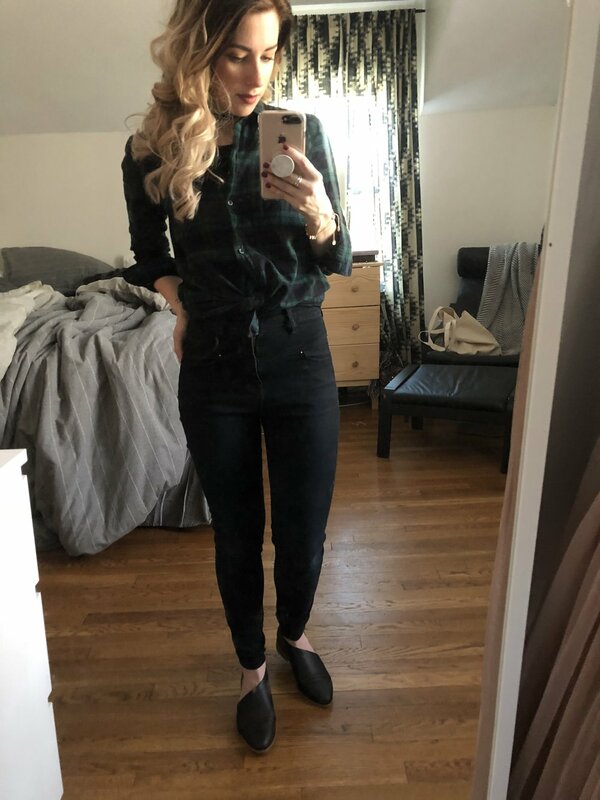 Let's break down my experience and chat about what I wore, the process and what's next! I really wanted to challenge myself a little here. I wanted to be intentional and thoughtful and really think through each piece I kept for my wardrobe. I selected 40 pieces total, including shoes, bottoms, tops, dresses and coats. NOT including workout wear, PJs and underwear etc. * 40 Pieces of Clothing. * NOT including workout wear, PJs and underwear etc. TIP: When creating your own capsule wardrobe there isn't a magic number of clothing items, pick what works best for you! I personally felt like 40 pieces offered me everything I needed. Also, you can select your own time frame. My initial thought was to do JAN-MARCH, APRIL-JUNE, JULY-SEP & OCT-DEC...but it looks like I'll be adjusting that to a summer capsule and a fall/winter capsule. The Prepwork: In order to get my capsule wardrobe ready I did a few things to prep...I went to my beloved Pinterest boards and started looking through my old style pins and pinning styles I loved. 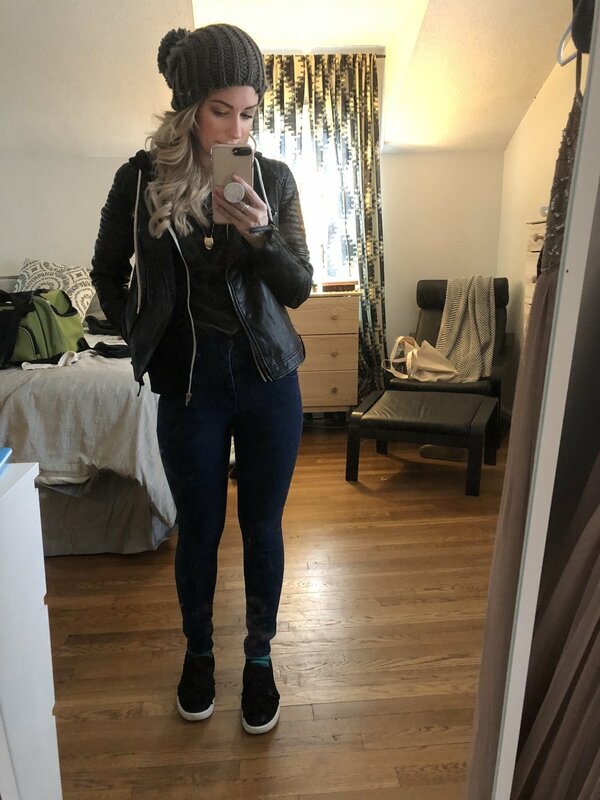 I wanted to get a clearer picture of what I truly enjoy wearing and feel my best in so when I started going through my clothes I had confidence in what I selected. I found the Un-Fancy wardrobe planner on getting a capsule wardrobe started to be really helpful as well as The No Brainer Wardrobe course. Both offer some GREAT insight! Going Through my Closet: I really took my time with this part, this is the most time consuming part of getting your capsule wardrobe set up. I started by making three different piles. TIP: If you have A LOT of clothes and feel really overwhelmed by this process, make it easier on yourself. Spending one evening just working through bottoms, another day focus on shoes and so on. Breaking it down like this makes it SO much easier to process. After going through my closet initially I went to my LOVE and maybe pile and tried on pretty much every piece of clothing. I wanted to see how I felt in the pieces and if they fit me well. This part is so much easier if you have a friend or significant other that can help you! Trying everything on helped me also see that while I loved some pieces, I didn't feel right in the color or pattern. They just didn't feel like me. For example: I'm totally drawn to the color red and stripes, but anytime I wear red or a striped shirt, I don't feel like myself. It's weird I know, but it totally helps to see everything on and really think through those things! Really think about the colors, cuts, styles, patterns, textures of the pieces you love. What do they have in common and what are you drawn to the most? What pieces make you feel like 100 when you put them on? The try-on process helped me to narrow down my clothes even more and completely get rid of my maybe pile so I was just left with my Donate/Sell pile and my LOVE pile. TIP: For your donate/sell pile consider selling some of your nicer pieces online to make money to go toward your capsule wardrobe, or host a little "shop my closet" party at your place with friends. For any of the pieces you decide to donate, don't forget to keep track of what you giveaway for tax write-off benefits! Selecting Your Capsule Wardrobe: So in order to start selecting your wardrobe you need a few supplies. 1. Matching Hangers (believe me, this makes your closet look SO much better!) 2. Storage Bins. 3. Pen & Paper. Now you are tasked with picking those special pieces you love to be worn throughout a season. Go ahead and store pieces that aren't weather appropriate in your storage bins. I personally filled two medium sized bins with clothing I loved but didn't want included in my capsule wardrobe. In general you'll want a good variety of shoes, coats/cardi's, tops, bottoms and dresses. Think about what's appropriate for your lifestyle and what you love wearing the most. I am a HUGE fan of layering so I kept a lot of coats, cardigans and layering pieces in my closet. I also love dark colors like black, grey, navy...so most of my wardrobe was very neutral in color and didn't have a lot of patterns. As you are going through and putting together your capsule, don't forget to write down pieces of clothing that might be missing from your capsule, keeping track will help you know what to buy when you need to fill in the holes! For example: maybe you tossed out a white top because it was stained, but you need one to replace it for your current capsule, go ahead and write that down so you know what to shop for! Once you've put together your capsule with what you have, start shopping for the remaining pieces you might need, if any. Set a budget and shop smart. Remember to keep in mind quality, durability and what you feel awesome in! Jeans - I picked 5 pairs of jeans in different washes and styles. I'm a total jeans girl! Overalls - I didn't wear these as much as I thought I would. Faux Leather - I love wearing this style so I picked a heavy one and a lighter faux leather jacket. Dark Green Winter Coat - For those cold days! Hoodie - I wore this ALL. THE. TIME. Loved layering with my jackets. Cardi's/Kimonos - I picked 4 in a few different styles with mostly neutral tones. Sweaters - I'm not a big sweater person so I just picked 2 grey ones. I don't wear dresses very often but I wanted to have at least one for the winter season for special occasions. For this category I picked a lot of neutral toned, band t's, graphic t's, button ups and solid tops. I wanted a good variety and pieces that layered well with lots of other pieces! Getting my wardrobe set up definitely took some time and care but after I got everything put together and started wearing my pieces day by day I found it SO freeing! It was easy to put together outfits because I took a lot of care selecting pieces I loved and felt good in. My closet didn't feel overwhelming anymore. I didn't feel like I was wasting money on disposable clothing willy nilly whenever I thought I needed a new outfit. If I could re-do my season 1 wardrobe I would have been more intentional about starting a new one and switching things up sooner, instead of waiting 5 months. Haha! I definitely felt myself feeling less inspiring and a little more dull after the first 4 months. So I think keeping the time-frame from 3-4 months at a time is ideal for me personally! I also found that I wore pretty much everything consistently with the exception of 3-4 pieces that I either didn't wear at all or only wore 1-2 times. I might have over-worn a few pieces and I think next season I'll challenge myself to keep things fresh and not just gravitate to a small handful of items so I don't get bored too fast! I am REALLY excited about putting together a new wardrobe for Season 2 and getting creative with my look. I'm still keeping it to 40 pieces and I've found as I'm in the process of putting my capsule together that it's MUCH easier to go through everything the second time around than when I initially had to go through my closet. It definitely makes continuing a capsule wardrobe easy to maintain! So right now, I'm getting rid of/selling a few pieces from my capsule and from storage that I'm not into anymore, I'm keeping a few pieces from my previous capsule in my new season, I'm pulling a few things from storage and I'll be making a few purchases to fill in the rest! As soon as I get my summer capsule finished, I will be sure to share everything I selected! Older PostHEALTHY CHOCOLATE, OAT & GINGER COOKIES! Welcome to my corner where I share my big love for wellness, motherhood magick, beauty, home life and intentional living. Married a hottie husband, mama to Soren (ASD) and Aria Fox, wellness coach, candle maker, bada$$ boss. Inspired by faith, late night coffee dates & music from the 70's. Follow along as I document 2018 with Project 365. Less perfection, more life. "Only speak the words that make souls stronger." HEALTHY CHOCOLATE, OAT & GINGER COOKIES! I FINISHED WHOLE30 + MY EXPERIENCE!